No Troop Withdrawal: The US is Planning the “Permanent Occupation” of Syria? Trump lied about winning against ISIS, the scourge the US created and supports, along with al-Qaeda, its al-Nusra offshoot, and other jihadist groups. “We have started returning United States troops home (sic) as we transition to the next phase of this campaign,” White House press secretary Sarah Sanders added. In mid-December, Trump said all US forces would be out of Syria in 30 days, in January extended to 120 days. In June 2018, we reported that US combat troops were illegally occupying northern and southern parts of the country aren’t leaving, their numbers likely much larger than officially reported, including elite special forces. They’re deployed to around three-fourths of world countries, CIA operatives covertly everywhere worldwide, most often masquerading as diplomats. There’s no ambiguity about their mission in US combat and other theaters. Along with propping up friendly despots, they’re involved in toppling sovereign independent governments, the US wanting pro-Western puppet regimes replacing them. Using ISIS and other jihadists as imperial proxies, Iranian and Syrian governments are targeted for regime change – NATO, Israel, and other regional rogue states in cahoots with US plans. Earlier reports of pulling US forces from Syria were greatly exaggerated. Weeks after Trump’s mid-December announcement, none were withdrawn, just redeployments from one location in the country to another, along with moving them back and forth cross-border between Syria and Iraq. At the same time, hundreds of truckloads of weapons, munitions, and military equipment were sent to Syria by air and cross-border from Turkey, Jordan, Iraq, and Israel. They keep coming. Indefinite US occupation of northern and southern Syrian territory is planned, Pentagon forces operating from 18 or more bases in the country – platforms for supporting ISIS and other terrorists, along with waging endless war on the country for regime change. In late January, hundreds more US troops were sent to northern Syria, according to Turkey’s Anadolu news agency. 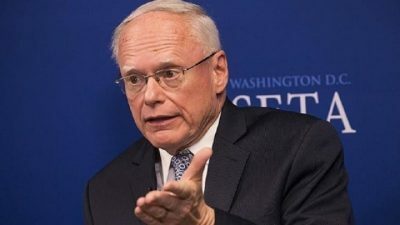 US envoy for regime change in Syria James Jeffrey said US forces will remain in the country for “a very long time.” Withdrawal of some will likely shift them cross-border to Iraqi territory bordering Syria for easy return to the country if ordered. US occupation of nations is permanent, true of Japan, Germany, South Korea, and other countries post-WW II – true in the Middle East, Central Asia, and North Africa post-9/11. An earlier Pentagon statement said US forces will stay in Syria indefinitely – as long as ISIS remains a threat, its scourge supported by Republican and undemocratic Dem regimes. In February, Senate members voted 70 – 26 against withdrawing Pentagon forces from Syria – claiming “a precipitous withdrawal” could destabilize the (already hugely destabilized) region, adding pullout would benefit Iran and Russia. They’ll remain in northern and southern parts of the country, bordering Turkey in the north, Iraq and Jordan in the south. In February, Trump said he intends leaving 200 US troops in the country after saying they’re all coming home. Now it’s a 1,000. Numbers cited are meaningless. As long as the US maintains a military presence in Syria and elsewhere, Pentagon commanders will decide on numbers to deploy to all theaters – together with the US war secretary. Occupation of Syria began early in the war the Obama regime launched in March 2011. Unknown numbers of US forces will remain in the country indefinitely.